Mobilizethis 2010 is 5 years strong and one hopes that this critical conference held at Darwin University and hosted by Bill Wade will continue in the years to come. Remember this conference is for those physically present and those distantly present. It is of no cost to participants apart of course for the cost of time. Time well spent if you are in the educational arena, seeking out the new technologies that enhance the learning experience not only for the clients in education but for those teachers/lectureres/facilitators. The technologicial revolution in education is NOT new, however it is organic and evolving at a rapid pace. An excellent comment made today 'Teaching is not dead, Teaching is a most noble profession, Learning is alive and well. In short some teaching or pedagogical approaches must die and modified, changed and new ways embracing the new age we are in must be explored, trialed and implemented, to ensure the currency of learning. Technology provides all educators and learners with new tools that when used well, not only enhance learning but ensure the currency of learning. I still remember the days when overheads were new, when powerpoint was the rage - 'death by powerpoint', when old out of date videos were used, gee even when text books were the main focus of teaching. There were roadblocks at each stage, people not wishing to embrace the new methods of teaching and learning practice. Even when educators were supplied with lap tops, so that they could embrace new technologies the resistance was great, same with videos, dvds and many moons ago the publication of books were for the elite only - in China books were burnt. We have progressed folks, no doubt about it but some of the constraints still seem near impossible to break free of. Mostly from administrators, management in institutions who are stuck back in time and seem to have a mental block as to how technology can be better than the sage on the stage telling learners what to know, what to do. Time has come for some to simply get their heads out of the sand, embrace the innovators within organisations and enable them to learn more, remain current, provide them with the time to research to provide best practice and allow them to champion the new pedagogy and work on those resistance to change. I was most encouraged to hear more about POV Point of View Technologies and the place they now hold in learning and the fact that this will increase over time. RMIT's presentation too encouraging with their program CreateED, drawing on leaders from within areas in the creative arts arena to encourage all staff to engage, trail, try new things and support them in doing so. Still a struggle and a hard road but their model and experience to date is heartening. I encourage all to go to the conference Wiki www.mobilizethis10.wikispaces.com and learn more from the presentations conducted so far. I also encourage all in the creative arts arena both in education and the music/art industry to join in tomorrow's sessions which you will find on the wiki site. Register - it costs nothing - just some time on your part to participate from wherever you are in the world. Should you be interested in presenting and sharing your experiences, challenges, trials and errors we would love to hear from you. Please let us know if you would like to present at Mobilizethis 2011. Hope to see may online tomorrow engaging in the live presentations - yep you can do from wherever you are in the world. Tomorrow is the final day - even if education is not your area, there is much to learn for musicians, artists of any form, media including photography, fashion and design. Be one of the innovators and not a laggard - it will them be a win win for all concerned. The time is approaching quickly for the 2010 Mobilizethis Conference. I will be in Darwin for the conference as a speaker and participant and helper with all. The Conference is 5 years strong. Remember that you do not need to be in Darwin to participate in this Conference. You can join in the events online, yes remotely from wherever you are in the world. If you have the slightest interest in the latest on mobile technologies, the use of online technologies in learning or for business, then this Conference is for you. Please follow the link and register for the Conference. No charges folks this event is open to all at NO COST. Rose, you are still tending to the rose you planted here in my garden. I am forever thankful. It has never blossomed like this before. Sweet, sweet Rose, thank you for continuing to care for the rose bush and for letting me know you are still very much with us all. I will never leave you behind. Your rose bush will follow me until my journey on this plain ends. I will take cuttings and pass on to others who loved you as you loved them, so they too may marvel at your beauty on this plain for all eternity. What a shame about Ning. I had so many different networks on Ning that I created and worked within, providing myself and others with a wonderful network and learning environment. Shame about the old bait and switch tactic used. Sucked me in and then all of a sudden I had to pay to keep going, after all the time and effort put in. Something we all need to be cautious of as if one uses such a tactic, I am sure others will follow. Sorry Ning, you were a good friend but I am not about to pay for something that I can create and use elsewhere for free and actually be in control of. Sweet Rose, I was just in the garden tending to the roses you so tenderly cared for when you were here. The bush with the most blooms is the one with the long stemmed RED ROSES which I always called Rose, as just like you they are tall, slender, beautiful, rich, warm, proud, full of life and their aroma so powerful. I returned inside to find that your dearest JP, Raphael Labro had sent to me on facebook an image or you my precious girl, created for you and it seems to help us all on this journey that we did not expect. You my love, Rose in the Heavens. Here it is for the world to see, share and cherish. Rose Berry Lamrock, I love you so much. Your spirit in the universe is strong, I feel you each day. Your favorite waterfall precious Rose with family and friends setting you free to spread your love, lights and cosmic cuddles to the world. A child of the universe eternally. Well there has been a great deal of hype this year about a new social media marketing platform, named 'Kajabi'. It looks great but I will reserve judgement until I get to play with it. See it for yourself here and learn how it may help you. This year the Live Music Scene in Melbourne was hit hard with the liquor licensing laws and the effect that these had. The Tote even had to close it's doors for sometime and many venues, that once staged lived music events, simply pulled them. Concern was so great that there were a number of sites pop up on facebook and the web, each seeing people rallying to stand up and fight for what was right - Melbourne is Live Music. The number of supporters continues to grow and it appears that before the November election this year of course, the government and the music industry (I still seek clarification on who exactly this was and is) have made an agreement. The agreement for your reading pleasure can be found at www.slamrally.org just follow their link. I am yet to fully digest the entire agreement but upon a quick glance, I am just not sure if it is robust enough. It is well written 'polly speak' that is for sure. I will return in a few days to give you my informed opinion. In the meantime, I look forward to reading your comments on the agreement. Facebook today began letting users form cozy cliques as part of a move to give people more control of their information at the world's most popular online social network. A "Groups" feature that lets Facebook members set up private online havens for clusters of co-workers, family, teammates, or others was unveiled at a press event at the firm's headquarters in the California city of Palo Alto. "We think that what we have out of the box, version one, blows away everything else," Facebook founder Mark Zuckerberg said, referring to "groups" services offered by internet stalwarts such as Yahoo! and Google. Facebook also began rolling out a feature that will let people download all pictures, video, comments and other digital information they have uploaded to the social networking service. 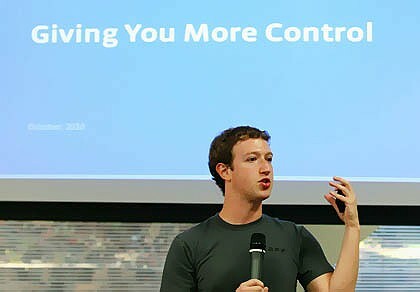 "Download is really so you can have a copy of all your information," Zuckerberg said. "You own your information. You should have control over it. You should be able to do whatever you want with it." A new "dashboard" feature to be rolled out in the coming days will let Facebook users see and manage what information in their accounts is accessed by third-party applications. It's only the third time in the Festival's 19 year history that a second show has been staged in any city. We also need to thank the artists, managers and agents and of course our team that have 100% supported the staging of a second Sydney event. Tickets for the 2nd SYDNEY BIG DAY OUT 2011 will go on sale MONDAY, 11 OCTOBER. It's looking like a great summer, enjoy!! BIG DAY OUT 2011 FEATURING: TOOL, RAMMSTEIN, IGGY AND THE STOOGES, M.I.A, JOHN BUTLER TRIO, GRINDERMAN, WOLFMOTHER, LCD SOUNDSYSTEM, BLOODY BEETROOTS DEATH CREW 77, CRYSTAL CASTLES, LUPE FIASCO, PRIMAL SCREAM SCREAMADELICA LIVE, THE BLACK KEYS, DEFTONES, BLISS N ESO, ANGUS & JULIA STONE, PLAN B, PNAU, DIE ANTWOORD, EDWARD SHARPE & THE MAGNETIC ZEROS, BOOKA SHADE DJs, ANDREW W.K., THE JIM JONES REVUE, BIRDS OF TOKYO, LITTLE RED, GYROSCOPE, VITALIC, CSS, RATATAT, AIRBOURNE, DEAD LETTER CIRCUS, BLUE KING BROWN, THE NAKED & FAMOUS, OPERATOR PLEASE, CHILDREN COLLIDE, GYPSY AND THE CAT, WILL STYLES, LOWRIDER, SAMPOLOGY, KIDS OF 88, KID KENOBI & MC SHURESHOCK. Stay tuned for more line up announcements in the coming weeks. WEDNESDAY, 26 JANUARY - SYDNEY SHOWGROUND – SOLD OUT!!!!! Showground Rd Sydney Olympic Park. Gates open 11am. Event closes midnight. You will be asked to read and agree to our Conditions of Sale and Admission before you can purchase tickets. New Worlds To Embrace, New Journeys to Enjoy! Jacinta Gascoigne is a passionate learner. Driven by her insatiable thirst, to find new and engaging ways to learn and then embrace, employ and embed in pedagogy. Learners, the currency of learning, equality, privacy, safety and rights are critical element’s of all Jacinta’s work. Sharing her experiences openly and in an honest manner online, proving that making mistakes is ‘Okay’. Sharing always in a manner that does not intimidate, nor overload those who wish to join. Open discussion combined with a ‘Show and Tell’ the most enjoyable and productive choice. Opportunities afforded her since 2002 have each taken her on a journey of “Infinite Worlds on the “Infinite Web”. Moving from only, funded community forums, email and government funded platforms, Jacinta is now fully immersed in the “Open Social Web”! Jacinta’s travels the worlds found, visited, joined, exploring still, follow no plan, no formula, no expectations. Curious.....how many of your facebook friends do you REALLY KNOW! at least half i think, if u define 'know' as 'have actually met'.........the rest are generally friends of people i know, or people i know by reputation - and im not afraid to block!!!!! Interesting. I would hope that we know all of the friends on our facebook profile. All it takes is ONE BAD ONE to SPOIL yours and others WORLD! The War Over iPad Type Technology In Australia Is HOT! I hope you are all ready. The onslaught from telcos and others is currently warm but is about the get really HOT! Question: Do you check peoples profiles out carefully before accepting or requesting friendship on facebook? Comment: If you do not you are putting yourself and others in danger and wasting your time. Please be careful. Lesson: Remember the old saying 'Stranger Danger' it is just as applicable in virtual world as it is in the physical world. I have listened to and read many works by so called, 'social media' experts in Australia recently and there is a glaring gap. None of them have been providing information as to what the rules, rights and responsibilities are when using the various platforms, such as facebook, twitter, myspace, reverbnation, youtube and the like. Yes, there are more using social media for business, marketing purposes. No we should not use without knowing exactly what we are signing up for or signing away.